Hi, I am interested in your 1976 Chevrolet Monte Carlo (stock #4655-ATL) listed on Autotrader for $18,995. I'd like to get more information about this vehicle and confirm its availability. Its one seriously long and cool 70s coupe and its as original as can be - under the hood, as well as inside and out. Just climbing into this 1976 Chevrolet Monte Carlo will make you want to celebrate our countrys bicentennial all over again. This one-owner outlier has logged a scant 63,000 miles during its considerable lifetime and comes complete with plenty of documentation to prove its originality, including its dealer invoice and the bill of sale issued right before it drove off the lot for the first time. If you were to seek out a sterling example of 70s automotive styling, youd be hard pressed to do better than this one. At a time when manufacturers were planning their concessions to rising gas prices and uncertain fuel supplies by continually shortening wheelbases and downsizing other dimensions in the name of frugality, this Monte Carlo hit the street with unapologetically generous proportions - its long through the hood and deck lid, with a sizable cabin sitting in between thats capped at the rear roof line in vinyl and sports one of the coolest aesthetic cues of the era - opera windows. The exterior is decked out in the same cream color it began with and, having received a freshening up somewhere along the line, is sporting a nice, smooth finish. The years have been kind and this Chevy has a vital, road-ready appearance to it, with clear glass surrounding its cabin, strong body alignment and trim, and headlights and taillights that look nice and fresh. The tan interior hasnt seen the inside of a restoration shop and yet remains in an overall strong condition. The wide, plush front buckets sit over slightly darker carpeting for a nice contrast and they not only fold forward to allow easy access to the back seat, but also swivel on their foundations to make getting in and out a breeze - how cool is that? Theres some evidence of expected wear here and there, but climb on in and youll be surrounded by straight, unblemished door panels to each side and a nice fitting headliner above. The functionality on hand here is a welcome surprise as well - all of the gauges inside the instrument cluster work as intended and only the AM/FM radio and dash clock will need attention to get back online. The air conditioning is also working, so you and your crew can cruise in comfort throughout the year. In back, the trunk area is spacious and in very good order - a full size spare sits neatly wrapped in a cover matching the floor and the inside looks pretty much as it did when this Chevy was new. The engine bay is very nicely detailed - it would be considered plenty clean on a modern car, let alone a classic more than 40 years old. The original, numbers matching 350 cubic inch V8 sits at the center, still running strong and surrounded by a complete assortment of belts and hoses. The exhaust components were replaced not long ago, so the exhaust note produced is smooth and deep as the powerplant pairs with a 3 speed automatic TH350 transmission. Power steering makes navigation easy, while power brakes that feature discs up front provide dependable stops as this lengthy classic cruises on its set of 15 Chevy-branded wheels with spinner-style centers that are wrapped with Dunlop Radial G/T Qualifier tires. The undercarriage reflects the same unusually clean condition shown by the rest of the car. 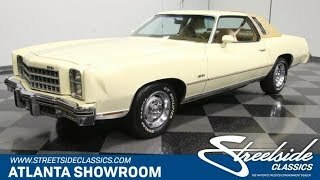 This 1976 Chevrolet Monte Carlo is one very stylish ride and its well-preserved exterior and smooth-running drivetrain make it a standout. Call today!